ORLANDO - June 15, 2015 – More than 1,200 Astellas Pharma employees worked together during a corporate meeting to help A Veterans Community, a nonprofit organization with a mission to provide safe, stable housing to homeless veterans and their families. A staggering 17 percent of the homeless population in the U.S. are veterans. Research shows that the greatest risk factors for homelessness are lack of support and social isolation after discharge. Astellas employees assembled 1,800 care packages for homeless veterans, which will support the organization for the rest of the year. In addition, employees at this event along with a match from Astellas contributed $25,000 to the American Red Cross to support its vaccine program. Astellas employees in the Americas have donated $1 million to charitable organizations through the Company's StarGIVING program over the last 10 years. 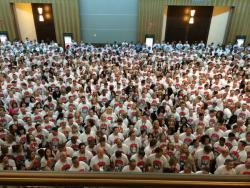 This year, Astellas employees commemorate the Company’s 10th anniversary by pledging to contribute 10,000 volunteer hours between May 2015 and March 2016. In the U.S., employees are taking part in various volunteer activities, including restoring a park, supporting food banks and preparing meals for families of children in pediatric hospitals. In Canada, Astellas employees renovated a summer camp near its Toronto headquarters for pediatric cancer patients. Astellas employees in Brazil will engage in volunteer initiatives focused on patient care in Sao Paulo and its surrounding communities.